Most kitchens now have a microwave nestled in them somewhere and while they may not be one of the most attractive appliances, they're certainly one of the most useful. It's true that some people abhor them because of their associations with ready-meal culture but if they're used sensibly they really can be a great help. You'd be surprised just how versatile the microwave is and there are plenty of occasions when it's quicker and simpler to use it instead of heating up the oven. As with all kitchen appliances, it's best to start off by preparing something very simple like a jacket potato. Obviously, re-heating is one of its main jobs but casseroles, vegetables, chicken and meat can all be cooked in the microwave, saving time and effort. It's a particularly useful gadget for a student kitchen as, inevitably, there's often going to be two or more people in the kitchen cooking different meals. When this happens, you don't necessarily need to wait for your turn at the oven: just pick something that can be cooked in the microwave. It will also come in handy if you're cooking for a crowd - use it to cook the vegetables for your roast dinner, if you run out of space on the hob. Believe it or not, microwaving is actually a pretty healthy way to cook. Unlike other methods, such as frying, you don't really use any oil when you cook in the microwave so food will have a lower fat content. Vegetables tend to steam themselves and therefore retain more minerals than they do with other types of cooking. They also cook a lot more quickly than if you were boiling them so again, fewer nutrients will be lost. So, it is possible to use your microwave to create complete, healthy meals. It might also mean you're less likely to dial for a takeaway whenever cooking seems like too much hassle. A couple of spuds and a can of beans is all you need to create a filling, nutritious meal that takes less than ten minutes to prepare. Never put metal containers or implements in the microwave. Pierce film lids, or foods with skin, before cooking to stop them 'exploding'. If you're reheating a meal or soup, stir it halfway through cooking to ensure the food is cooked through evenly. Allow your food to stand for a minute or two before you eat it. Microwaves can be deceptively powerful and you might have a bit of a hot spot. 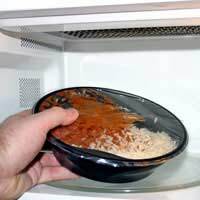 Use your microwave to quickly and safely defrost food before cooking. Freeze meal leftovers in individual, microwavable containers so it's easy to just heat up one portion. Cooking in the microwave isn't a cop-out. As long as it doesn't become the only cooking method and you end up standing in front of it every evening as a ready meal spins around, it's fine. Get creative and use your microwave to save time and washing up!